Don’t you love this necklace from Michelle? 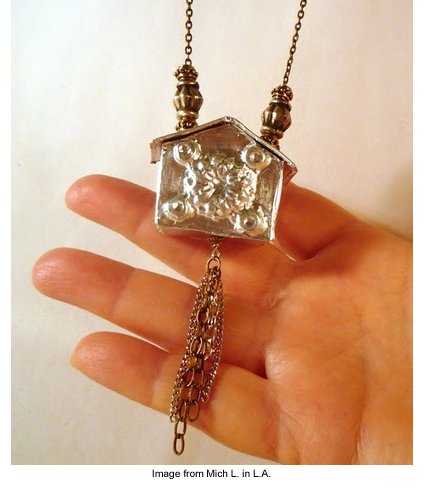 At first glance, I guessed she constructed her crooked house pendant from metal clay – nope! Michelle’s pendant requires no kiln and very inexpensive materials. Her little house even has a secret compartment for your tiny treasures. See how clever Michelle is and take a look at her free tutorial to make your own house pendant. Will yours be crooked, too? I think that adds just a little whimsy to the design. Thanks for sharing, Michelle! This is such a clever way to reuse old tissue voxes. I’ll make some of these for gifts. Very cute and very clever! I though it was made of silver or another metal. I think that i will experiment with some old Easter egg foil! how about gold and dark purple!